Unlock the mysteries of the occult in this dark and dangerous game. Click here to play! Learn the spells and charms of witches and warlocks for a chance to conjure up payoffs beyond belief! In order to effectively start casting money spells of your own, you'll need the help of the Witch and the Warlock in this exciting game. The Witch only appears on reels 1, 2 and 3. 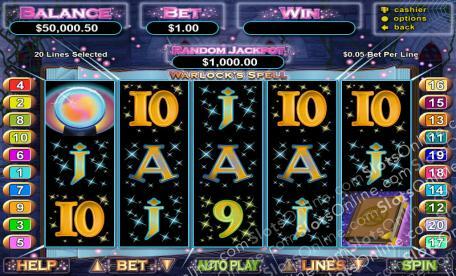 The Warlock only appears on reels 3, 4 and 5 but one or more of either will pay out up to 10000 times your original line bet. They will also substitute for all other symbols, excluding scatters, to help you create more winning combinations. What would a witch/warlock be without their black cat? These mysterious animals will pay out up to 5000 times your original line bet if you spin two or more across a pay line. Try to collect jewels, potions and crystal balls for more chances at winning as each will payout if you can spin two or more on a pay line. Once you've learned the ways of the Warlock, you'll need a spell book. This symbol acts as a scatter. Three or more anywhere on the board will multiply your total bet. It will also trigger the Potion Prize Feature in which you'll have to pick your potion ingredients for a chance to win multipliers or free games. So join in on the Warlock's spell for a chance to summon some big wins! The spell book acts as a scatter. Three or more anywhere on the board will multiply your total bet as well as trigger a bonus feature in which you can win free spins. The Witch and Warlock are substitutes. The Witch only appears on reels 1,2 and 3. The Warlock only appears on reels 3, 4 and 5. They both substitute for all other symbols, excluding scatters. Three or more scatters anywhere on the board will trigger a pick a box style game in which you have to pick a set of ingredients to win free spins. If you choose the wrong ingredients, the number of free games will decrease until you pick the right set.